But this advance isn't really about human drivers. Sitting at a stoplight and waiting what seems like an eternity for it to change. What a drag. Audi understands. Some of its newest models are equipped with a Traffic Light Information system that displays how long it will take a red light to turn green on the vehicle’s dashboard. Washington, D.C. became the most recent city in which this system works, joining Dallas, Denver, Houston, and Palo Alto. But in the end, this system isn’t really for human drivers. It’s for autonomous vehicles. The system is called Vehicle-to-Infrastructure (V2I). Using 4G, the car connects to the area’s centralized traffic light management system to access information that could, for example, help navigation systems determine the most efficient route, or slow vehicles down when a light is about to change, as The Verge reports. “This initiative represents the kind of innovation that is critical for us to advance the traffic safety goals of Vision Zero,” said DC Mayor Muriel Bowser in a press release. 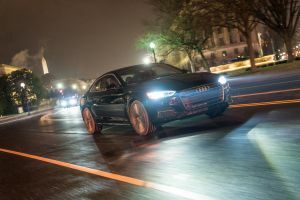 “We look forward to building on this and similar partnerships as we continue to build a safer, stronger, and smarter DC.” The partnership with Audi will also help the city to identify areas ripe for traffic improvement. If people are going to move around stoplight-free cities in AVs, improving systems that allow the cars to talk to the infrastructure, and to each other, will be critical. Cars like Audi’s could go a long way towards bridging the gap between our past of traditional vehicles and our future of AVs.